To celebrate the 10th anniversary of THE AGATHA CHRISTIE THEATRE COMPANY and the 125th anniversary of the author’s birth, AND THEN THERE WERE NONE returns to the stage. 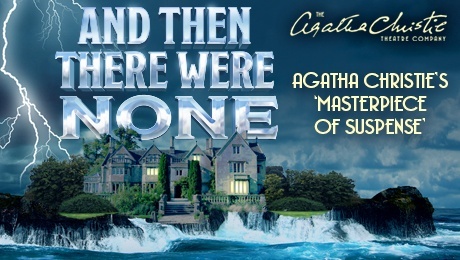 This production of the Queen of Crime’s most popular and best-selling thriller has been wowing audiences across the UK since January and comes to the Theatre Royal Glasgow from Monday 19 to Saturday 24 October 2015. Sixties pop star-turned actor MARK WYNTER stars as Dr. Armstrong and is joined by Bergerac and Peak Practice’s DEBORAH GRANT as eccentric spinster Emily Brent. KEZIA BURROWS, best known as junior doctor Cath Llewellyn in the 2009 BBC drama series Crash, joins the cast as secretary Vera Claythorne. They join Just Good Friends star PAUL NICHOLAS as judge Sir Lawrence Wargrave, COLIN BUCHANAN, who starred as Peter Pascoe inDalziel and Pascoe, as retired police inspector William Henry Blore, former Blue Peter presenter and actor MARK CURRY as Rogers,Soldier Soldier’s BEN NEALON as Philip Lombard and Bouquet of Barbed Wire’s ERIC CARTE as General Mackenzie. A group of 10 strangers is lured to a remote island off the coast of Devon. Upon arrival it is discovered that their host, an eccentric millionaire, is missing. At dinner a recorded message is played accusing each of them in turn of having a guilty secret and by the end of the evening the 10 guests become nine. Stranded on the island by a torrential storm and haunted by an ancient nursery rhyme, one by one the guests begin to die. And with only the fallen believed to be innocent who amongst them is the killer?